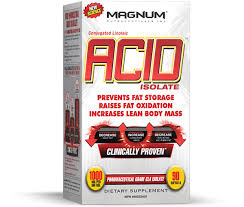 "Truly unique ALLMAX CLA95 yields 95% pure, ACTIVE CLA Isomers; 950 mg per 1000 mg Softgel!" 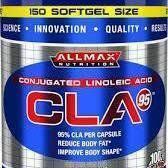 ALLMAX CLA95 from the brand you trust provides a high concentration of CLA. Look closely at your CLA label, most are 80% purity. Don't settle for less, get the highest strength you can buy! ALLMAX CLA95 is a true 50:50 ratio Active Isomer mix of pure cis-9-trans11 and trans-10 cis-12. Derived from 100% pure Safflower and produced in the world's largest pharmaceutical grade CLA production facility, ALLMAX CLA95 stands well above the crowd with the ultimate in purity and potency! Because EFAs are found in high concentrations in the brain, they are essential for nerve conduction and brain function. * Rapid nerve impulses are essential for any athlete. 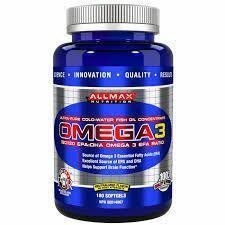 ALLMAX Omega 3 EFAs are an ultra-pure, highly-concentrated form of Omega 3 derived from clean deep ocean cold-water fish. Processed in a licensed facility with cGMP certification, our Molecular Level Distillation ensures that you get pure Omega 3 DHA and EPA factors. ALLMAX OMEGA 3 EFAs ARE FREE OF DETECTABLE LEVELS OF LEAD, CADMIUM, ARSENIC AND MERCURY. In fact, ALLMAX Omega 3 Essentials just received the IFOS 5-Star Rating for exceptional purity; the absolute highest rating possible! Enjoy all of the healthy benefits with ALLMAX Omega 3 EFAs. Molecular Level Distillation: FREE of all detectable levels of Mercury, Lead, Cadmium and PCBs. Neutralized Flavor = No fishy repeats.